Curbed Detroit and DetroitUrbex collaborated on an exploration of the Pontiac Silverdome, former home of the Lions, Pistons, and Wrestlemania III. Their photos of the ruined and abandoned stadium are depressing, but in way, there's also something serene about them. The Silverdome stopped seeing regular usage after the Lions moved to Ford Field in 2002, and maintenance costs led the city of Pontiac to put it up for sale in 2009. The 80,000-seat stadium, which was completed in 1975 for $55.7 million (about $245 million in today's dollars), sold at auction for $583,000. The new owner couldn't find anything to do with it; the Silverdome last hosted an event in 2011. In December of 2012, the iconic inflatable roof was permanently deflated—strong winds ripped it to shreds weeks later, and no one's bothered to fix it. The playing surface now sits on (and below) several feet of water. Nature reclaims everything, eventually. To turn some sort of profit on the site, the owner is preparing to auction off everything that's not nailed down, including seats, signage, and fixtures. 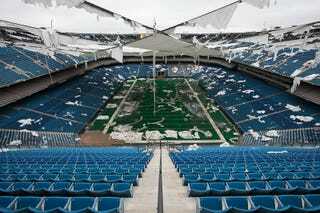 These photos are your last look at the Silverdome in anything resembling game shape. Check out DetroitUrbex for the full photoset. Below are some of the highlights.